A special election for New York’s 25th congressional district was held following the death of U.S. Representative Louise Slaughter. Democrat Joseph Morelle defeated Republican Jim Maxwell on November 6, 2018. Incumbent Representative Louise Slaughter died at the age of 88 on March 16, 2018, after suffering a concussion earlier in the month. Following precedent set in 2010, concurrent elections were held in November, one to fill the remainder of Slaughter's term, and the other to fill the seat for the next term. The district was left without Congressional representation until then. Nominees for Special Elections are selected by the parties in the counties that comprise the congressional district. There are no primaries. The filing deadline for Party Nominations was August 30, 2018 and for Independent Petitions was September 4, 2018. The following information pertains to the regular election for the 25th District for a full term to the 116th Congress. ^ Smith, Harrison (March 16, 2018). "Rep. Louise M. Slaughter, N.Y. Democrat who championed women's rights, dies at 88". The Washington Post. ^ Reisman, Nick (August 20, 2018). "Cuomo Synchronizes NY-25 Special With General Election". NY State of Politics. ^ "City Councilman Adam McFadden running for Congress". WHAM. March 30, 2018. ^ a b "Joe Morelle on possible Special Election run after Louise Slaughter's death". WHAM ABC13. March 17, 2018. Retrieved March 20, 2018. ^ a b c Gorbman, Randy (March 26, 2018). "Candidates for 25th Congressional seat announcing". WBFO. Retrieved March 29, 2018. ^ a b c Domingues, Christina (March 22, 2018). "JOSEPH ROBACH AMONG LIST OF CANDIDATES CONSIDERING RUN FOR SLAUGHTER'S SEAT". Spectrum News Rochester. Retrieved March 23, 2018. ^ "Assemblyman Joseph Morelle to run for Louise Slaughter's congressional seat". Rochester Democrat and Chronicle. Retrieved March 26, 2018. ^ a b c "Race heats up to fill Slaughter's House seat". The Hill. March 27, 2018. Retrieved April 2, 2018. ^ "Building on the Legacy of Progressive Leadership for the Rochester Region". www.crowdpac.com. ^ Moule, Jeremy (March 28, 2018). "Wilt launches House bid, picks up progressive group's endorsement". Rochester City Newspaper. Retrieved April 2, 2018. ^ Cleveland, Will (April 4, 2018). "Rachel Barnhart secures signatures for congressional primary to run for Slaughter's seat". Democrat & Chronicle. Retrieved April 6, 2018. ^ "Rachel Barnhart to announce bid for 25th Congressional District seat". WHAM. April 17, 2018. Retrieved April 18, 2018. ^ a b c d e Campbell, Joe; Orr, Steve (March 16, 2018). "Rep. Louise Slaughter: How will her successor be chosen?". Democrat & Chronicle. Retrieved March 18, 2018. ^ a b c d e f g Vielkind, Jimmy; Mahoney, Bill (March 16, 2018). "As Rochester mourns Louise Slaughter, a 'scramble' looms to succeed her". Politico. Retrieved March 19, 2018. 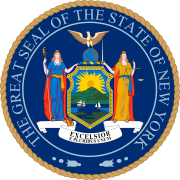 ^ "New York Primary Election Results: 25th House District". Retrieved July 12, 2018. ^ Gorbman, Randy. "Rochester neurosurgeon announces Congressional bid". ^ Gorbman, Randy (March 24, 2018). "Sen. Joe Robach says he won't run for the Congressional seat held by Louise Slaughter". WXXI. Retrieved March 24, 2018.